The Dance, Creativity, and Culture Program at The Evergreen State College presents: Truth: Movements of Peace. Several vignettes written by students during the fall quarter of 2003 will culminate into one cohesive piece in this production directed by Dr. Ratna Roy and dance students of the program. Creative interpretations stemming from the teachings of faculty Dr. Ratna Roy and faculty Dr. Mukti Khanna will be represented in this performance which transcends time and cultural borders. 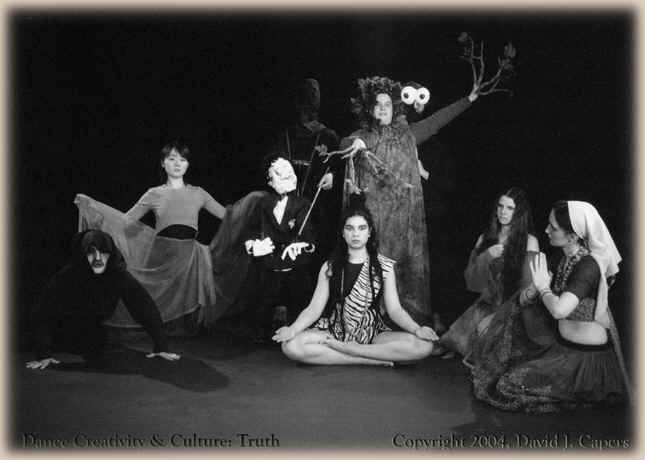 Oppression and non-violence themes are portrayed through dance, poetry, masks, media, and puppetry. Dance dramas inspired by Mahatma Gandhi, Malcolm X, Dr. Martin Luther King Jr., women's movements, domestic violence, child labor, eco feminism come alive through Orissi dance movements and fusion dance. contact Box Office at (360) 867-6833. Parking is $1.25 Thursday and Friday.